“Willkommen, Tobias. Boys and girls, please welcome Tobias from Berlin who will be helping out in the Modern Languages department”. And Tobias has the lunatic misfortune of arriving at Wordsworth comprehensive school on ‘Muck Up Day’ when the Year 11 (S5) pupils go off into the fabled ‘mists of Study Leave’. Run-up activities include include pinging shag bands, playing basketball in the corridors and placing a live chicken in the library. The finale will be an Achievement Assembly with a suicidal child on the roof. Welcome, also, by happy coincidence to May 2, 1997 when Labour wins a record-breaking 419 seats to form its first government since 1979. The manifesto promise of ‘Education, Education, Education’ is all over the staff room. The teachers are excited, jumpy, and the febrile atmosphere is only fanned by the breakout of Cool Britannia. Noel Gallagher of ‘Oasis’ will be at a Downing Street reception on the 10th, but Tobias (Max Prentice) is friendly and unassuming, a ‘Take That’ kind of guy. You’ll like him immediately and come to trust him, which is handy because where there’s perspective and order, there’s Tobias. Elsewhere, on this important day, the school is a frenzied, entertaining mess. Education, Education, Education won a ‘Fringe First’ in 2017 for the Wardrobe Ensemble. It seems, to my mind, a perfect choice for student performance. It’s funny and fast, dances to a 90s soundtrack, and skewers English education. Headteacher Hugh (Fergus Head) has all the moves – watch him go in D:ream’s Things Can Only Get Better – wants the best for all his pupils but all his enthusiasm cannot remedy the fact that his school is falling apart and has porta-cabins for classrooms. His Deputy, Louise (Kelechi Hafstad), is trying to hold it all together with discipline and an imaginary semi-automatic, which is dodgy, surely. History teacher Paul (most convincing by Lewis Foreman) has seen too many awkward kids to bother with them anymore. Tim (Giorgio Bounous) is the gormless PE jock and Sue (Becca Chadder) is the dedicated English teacher who inhabits that lovely world where she would share Malory’s Morte d’Arthur with 14 year olds but without the resources of Games of Thrones. No wonder then that Tobias marvels at it all whilst quietly enjoying a confiscated cheestring. A serious narrative is provided by Lauren’s story. Lauren Robinson is spot on as the difficult, challenging, pupil who shouldn’t be expelled but who probably will be. It’s good to learn, within Tobias’ retrospective account, that it’s Lauren who comes out to Berlin to visit him and to see a grown-up European country. Director Tom Whiston ensures that your sympathies go where they should. It’s those twenty years, 1997 to 2017, that give the play its bite. Its frenetic pace and half daft characters are contained within a frame that exposes the optimism of that Labour promise. Jack Whitehall’s Bad Education (BBC 3 2012 -14) was brilliant and ridiculous. 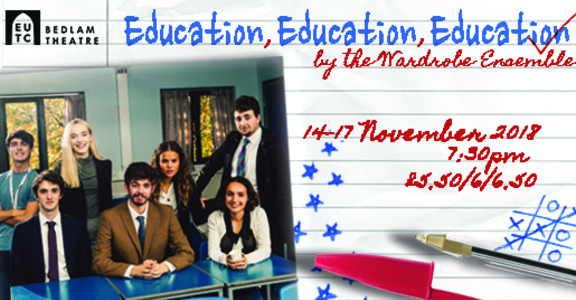 As a 60 minute stage show this production of Education, Education, Education cannot be telly but it’s a riot of understanding and good sense, which ain’t easy. 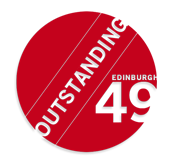 Visit Edinburgh49 at its Bedlam archive.